Arriving from Paris CDG after a pleasant flight with RJ118, we discovered with excitement the state-of-the-art new International terminal at Queen Alia Airport. Inaugurated in March 2013, it has already been awarded "Best Improvement by Region for Middle East" and "Best Airport by Region for Middle East" by the Airport Council International. 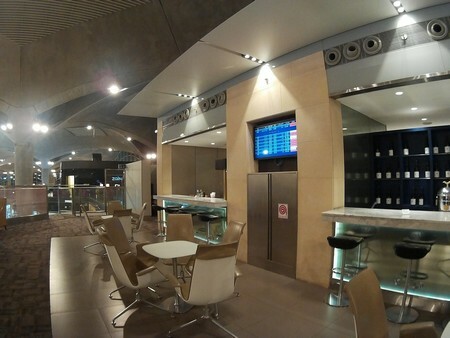 It looks like Dubai Airport quite a lot, on smaller scale. Nicely designed by architects Foster&Partners, this is a landmark of modern Middle-Eastern architecture, with a roof inspired by Bedouin tents and composed of 127 concrete domes: each weighing up to 600 metric tonnes. With a capacity of 7 million passengers per year, it remains far less crowded compare with Dubai Airport (we won't mention Istanbul Ataturk...). Sparkling and immaculate, it has a very attractive Duty Free shopping area (proposing traditional and Dead Sea gifts, featuring spendid mosaics) and many bars, restaurants... and even a nuts roastery! Actually it looked so quiet at only 6pm. We dislike very much the long security control procedure with erratic queues at Dubai Airport; nothing like this at Queen Alia, offering no rush and much relaxation to those transiting between two flights. Approximately 8 hours separated us from our departure to Bangkok (RJ has much better connections of course); which was no problem, as we decided to fully enjoy the privilege of the Crown Lounge / Oneworld Lounge. The newest, second largest first class / business class lounge in the Middle East, winner of the Priority Pass Lounge Award 2015 in the Middle East and Africa, can handle over 340 passengers. Located in the South Terminal on the second floor, it has an atrium view on the Duty Free area and on the runways. Maybe was it exceptional, but that evening we were 20 till maximum 30 lucky passengers to use it. Which sounded odd, compared with the impressive size of this plush VIP space. We showed our boarding pass, which was enough to be invited to safely leave both our jacket and cabin bag at the cloakroom before visiting this welcoming place. It has much to offer, indeed, with different bars: including The Grove, featuring a full menu of fresh fruit juices and cocktails. There was also a nice selection of mineral waters, sodas, beers, and liquors. The place must be sponsored by Saint George Vinery, as this was the unique brand of red and white wine available the day of our visit. We like Jordanian wine, and this was our pleasure to drink one glass of this nectar to pair our selection of Mezzes (silky smooth hummus, shish kebab, olives and Nabulsi goat cheese, olives). We had it with freshly baked pita bread, self-serviced from The Chandeliers Bistro & Bakery. WiFi Internet was very high-speed. We enjoyed the individual TV suites, playing programs and VOD which we could select stretching at ease on the ergonomically designed seating. We also experimented the large sofas for a short nap... before we realized that there was a special dimmed room with five leather beds ideally designed to fight the jet lag. We liked also very much the Shower Suites, smart and super clean, tailored made to feel fresh between two long-haul flights. It would take dozens of pages to describe the Crown Lounge, and only one word to summarize: impressive! Time flew so quickly: already 1 am! “Our” Dreamliner was waiting for us. Of course, Crown Class passengers are invited to board in priority if they like: they should do so, as there is no business class cabin-crossing by economy class passengers with this splendid aircraft. We have been called by our name -like with Emirates- as soon as we got into the cavernous entrance-way of this flying palace-hotel. Though we already saw many pictures and videos of the RJ Crown Class cabin, we have been actually surprised by its ideal volume. 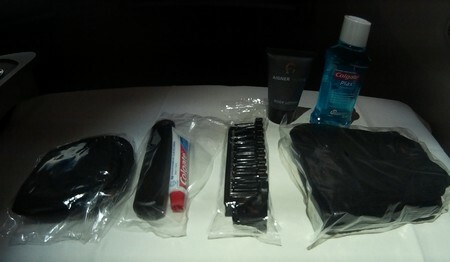 It is much more intimate compared with many airlines. 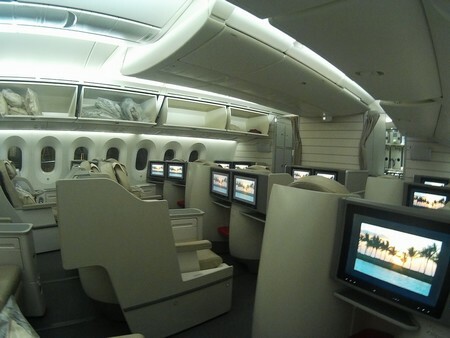 First of all, this segment of the cabin is called Premium Business Class (J), with only 4 rows of 2+2+2 seats. 24 in total. This represents 10% of the volume of the B787 (246 Economy Class seats in total). Compared with Emirates A380, featuring approximately 80 business class seats, Royal Jordanian acts one more time very much boutique style: with a more cozy atmosphere, dedicated comfort, and the real impression that you fly first class. Also, and this is important: the air feels fresher, with a better distribution throughout the cabin in the Dreamliner compared with other long-haul aircraft from Boeing. 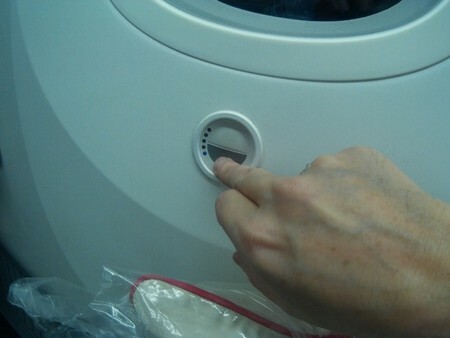 A revolutionary air-humidifier makes all the difference. It often happened that we felt uncomfortable, and even sweating little bit because of a dry and warm heating. This was not the case at all during that flight. 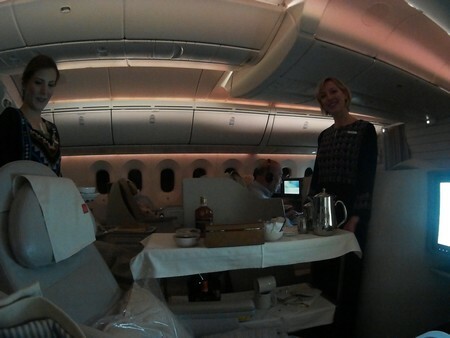 We felt comfortable on the spot and, once again, the cabin crew did a lot to make us feel like in our own private-jet. 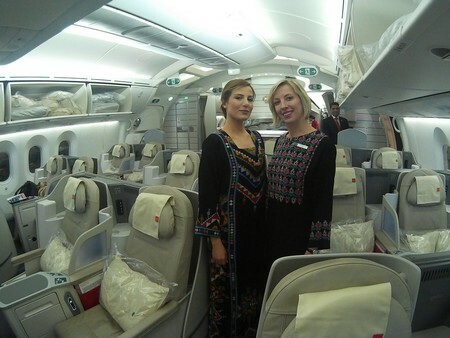 The head steward was anticipating with all passengers: responsive on any request immediately reported to the two stewardesses wearing the traditional Jordanian dress. This is a large plane, and it takes approximately 20 minutes to have all the passengers boarding. Our glass of Taittinger Brut Réserve came on a tray as soon as we got rid of our overcoat and hat. We kept our cabin bag with us: there was plenty of room, and each second seat was empty to increase the comfort of the passengers. We visited the aircraft little bit further, and loved the design of the bar with the noticeable RJ golden crown. The steward told us that many people asked to have their picture taken at the bar; we did so, as this is already like a tradition. The toilet was spotless, with the same toiletry described in our CDG-AMM review (hand-cream from the Dead Sea, 4711 Kölnisch Wasser), and cleaned repeatedly during the 7 hours and 26 minutes long flight. We peeped in the Economy Class cabin. It was full, but didn't look too crampy. This generation of airplane offers more comfort in all classes, and the RJ B787-8 Dreamliner had been recently delivered with plenty of options to please the passenger whatever the class he paid for. Take-off was right on time, at 01:59am, and the GEnx new generation of reactors are so silent that we had to look through the window to see that we were climbing in the skies. Well installed in our width, 21' seat (against 17' in Economy), we had a quick look at the magazines and newspapers which the attendant brought to us with a second glass of Taittinger Brut Réserve, inspected the quality headsets and checked the content of the fashion-chic and complete Aigner amenity kit. We received The Cellar Wine list and Royal Dining Menu with an aperitif (Campari) and nuts. The wine list is the same on medium and long-haul. The menu offers more options. We could order either European or Middle Eastern appetizers. Of course we chose the second options, with refreshing “Mezzes”(Hummus, salmon in dill and lemon, with aromatic salads and olive oil). From the selection of 4 main courses, Stir-Fried Beef with Vegetables in Oyster Sauce, Grilled Chicken with Chasseur Sauce, Fusilli Alfredo and Hammour fish, we selected the latter. Actually, this was the first time that we heard of that fish (something like a grouper), very popular in the Middle East. Flavorful, light, and flaky, it was served from the trolley with a generous selection of side dishes. 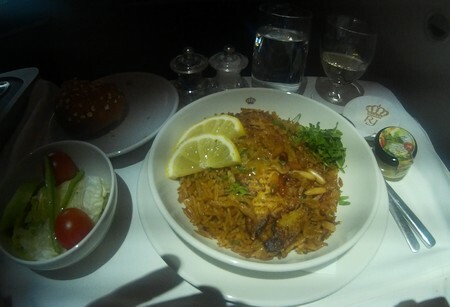 We had it “Sayyadiya”: pan-seared, on a bed of spiced Arabic rice, topped with browned onions and pine seeds, complemented with an aromatic “Bagdounsiya” sauce. This was definitely not tasting nor looking like industrial airlines food! The stewardess kindly suggested that we could order another main course from the menu. Sure she was joking... as the portion was set for a pasha. We paired both Mezzes and Hammour with the same glass of Saint George Sauvignon Blanc, a curious yet remarkable organic white wine, handpicked in Sama (Northern Jordan). Refreshing, it shows a nice mixture of chocolate toffee and a touch of vanilla. 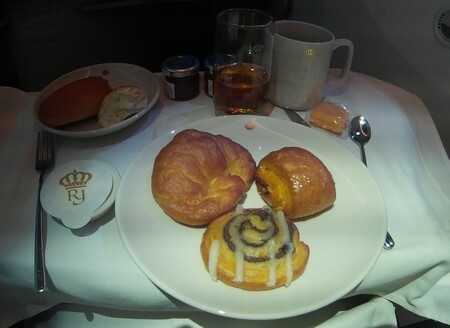 We concluded this fine diner with a yummy Cassandra Truffle, rich in cocoa, proving that on all RJ destinations pastries are exceptional in the definitely gastronomic Royal Jordanian Crown Class. We had it with a cup of quite a good coffee, and one glass of Cointreau to facilitate our sleep. 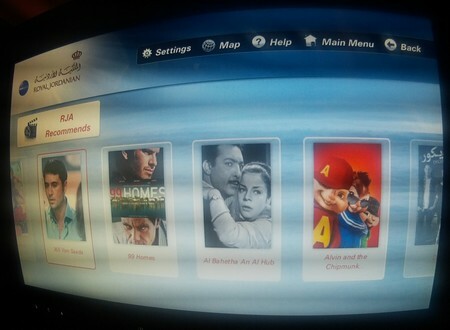 In Crown Class, the AVOD has a large library of movies, television shows, audio and games, as well as news provided by CNN displayed on a panoramic 17' plasma touchscreen. Unlike with Emirates, Internet is not available on RJ yet... and this is a pity, as we dreamed to share our impressions with our friends. 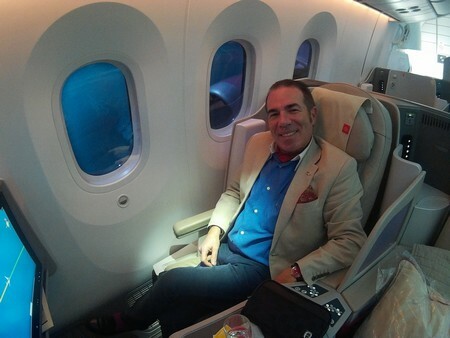 Showing them for instance the “Magical Windows”, which we discovered for the first time thanks to Royal Jordanian. The B787 Dreamliner has the best airplane windows ever. It ditches that small window with a pull-down plastic shade and replaces it with a larger 16' tall (65% larger than the standard airplane windows), dimming window that can be adjusted to let in various amounts of light. An electrified gel, sandwiched between two thin pieces of glass, darkens when the electric current increases; when it drops, the gel lightens. The system is as innovative as simple. We could control our window from a switcher: it allows five levels of aperture. Just like the diaphragm of a camera. The “Magic Windows” are also networking together: so flight personnel can control the windows, too. Attendants can adjust each window, adjust windows in an entire section of the plane or adjust them for the entire plane. These new dimming windows are just the beginning for Boeing and its research partners PPG Aerospace and Gentex Corporation. The efficiency of the dimming windows, plus the calm, cool palette of colours in the cabin made us feel so relaxed during the rest of the flight! 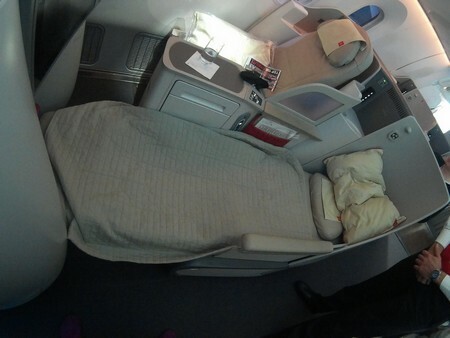 The head steward brought us a pillow and a soft cotton blanket, and converted our seat into a 180-degree fully flat-bed. The mattress was not too soft, not too hard, and we slept like a rock until a soft wake-up from the stewardess for a full breakfast. We only selected some fresh fruits, and excellent, freshly Danish pastries. The coffee was not Arabic, but American (though we are sure that they would have prepared Cardamon coffee on request). We had been also proposed Mango, Tomato, Orange or Apple Juice. We filled the Thai Immigration form, then could enjoy the last moments of this unforgettable flight until a soft landing by skilled Captain Zaid at Bangkok Suvarnabhumi International Airport at 2:25pm (two hours before the peak traffic time on the airport – Bangkok downtown highway)... little bit jealous of the passengers remaining in the Dreamliner continuing to Hong-Kong. We received a fast track to the Premium Lane, allowing a faster control at Immigration; however, we still waited for our “priority” luggage more than 45 minutes. Such is Thailand, where time doesn't count. “Mai pen rai”! We have mentioned a lot of pros concerning Royal Jordanian, globally. And more particularly about its distinguishing Crown Class. What about the cons? 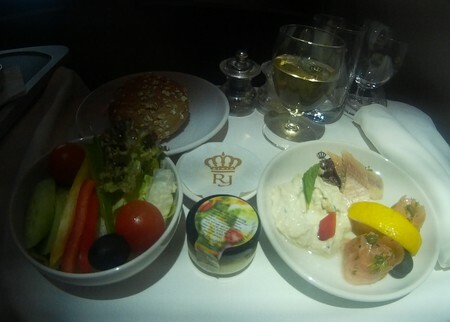 Except for WiFi, which should be part of the hi-tech equipment of the tailored-made-for-geeks Dreamliner, we would hardly find any negative comment, and actually do not understand why Royal Jordanian is rated 3-star by SkyTrax. 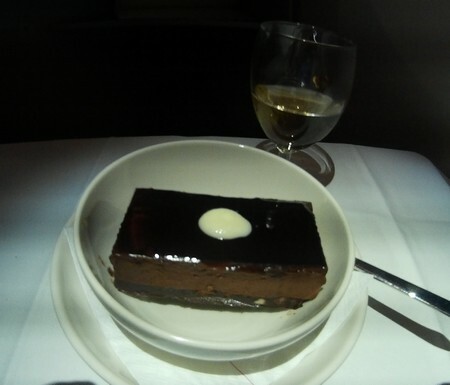 We experienced the best service, no delay, delicious food, quality entertainment and a very high-level of security in a well-maintained A320 and a brand new B787-8. Moreover, RJ covers many interesting destinations in the Middle East... including Tel Aviv. This is the unique Arabic airline serving Israel. It has also more and more clients from Russia (Moscow) and Ukraine (Kiev). Which explains why both RJ118 and RJ182 flights had a Russian speaking stewardess. Last but not least, this passenger-friendly airline gives all of us the possibility to get upgraded through a very exciting on-line “Bidding Offer”: tell them how much you are ready to pay for an upgrade, maximum 36 hours prior to departure, and RJ will email you before check-in to let you know whether your offer was accepted. From our point of view, Royal Jordanian ranks four - five star, indeed; due to the hearsh competition from Etihad, Qatar or Emirates, this reliable and lovable mid-size airline is trying its best to capture more passengers (Oneworld helps a lot), developping the already described “boutique” service and comfort which will make us travel with them again, and visit the Kingdom of Jordan so well promoted in the air by the spontaneous hospitality and kindness of the crew.